At Morrow, the school is always buzzing with three co-operative classrooms running in the morning and three classrooms in the afternoon. Each class has up to 12 students with both a dedicated teacher and a parent serving as the class aide. In addition, optional enrichment classes are run during the lunch break in between. This is the first school experience for many children. This class focuses on socialization, learning to trust other adults, experiencing routine and expanding their world outside family and their home. As the year progresses, children also build excitement for graduating on to the 3s. In the 3s classroom, children begin to explore outside the school setting and visit the local community through walking trips to the dentist, pizzeria and even apple picking. Curriculum follows the seasons, as well as sections on colors, shapes and recognizing names. They also have yoga twice a month in the classroom. As the year progresses, most children transition out of parallel play and develop stronger social skills. The 4s classroom combines a greater exploration of the world around us along with more traditional skills to prepare for Kindergarten. Field trips include a local farm, the planetarium, the Trailside Museum, as well as walking trips into Maplewood Village. In the classroom, children will practice letters and language including the Handwriting Without Tears program. They will do counting, the calendar, as well as learn their address and phone number. The 3s and 4s can participate in a variety of after or before school programs to complement our curriculum. This class offers a combination of math, science and dramatic arts/literacy building. Each session will be taught by our Morrow Preschool 4-year-old teachers with a different area of focus each week. There will be science experiments, hands on math activities and dramatic play. We will explore these areas in more depth than in a regular school day. Lunch Together is a once a week program provided for those who would like their children to share lunchtime with their peers in a safe, friendly surrounding. Children bring their own lunches and drinks to school and eat in the lunch room where they socialize with friends and listen to a story while they eat. 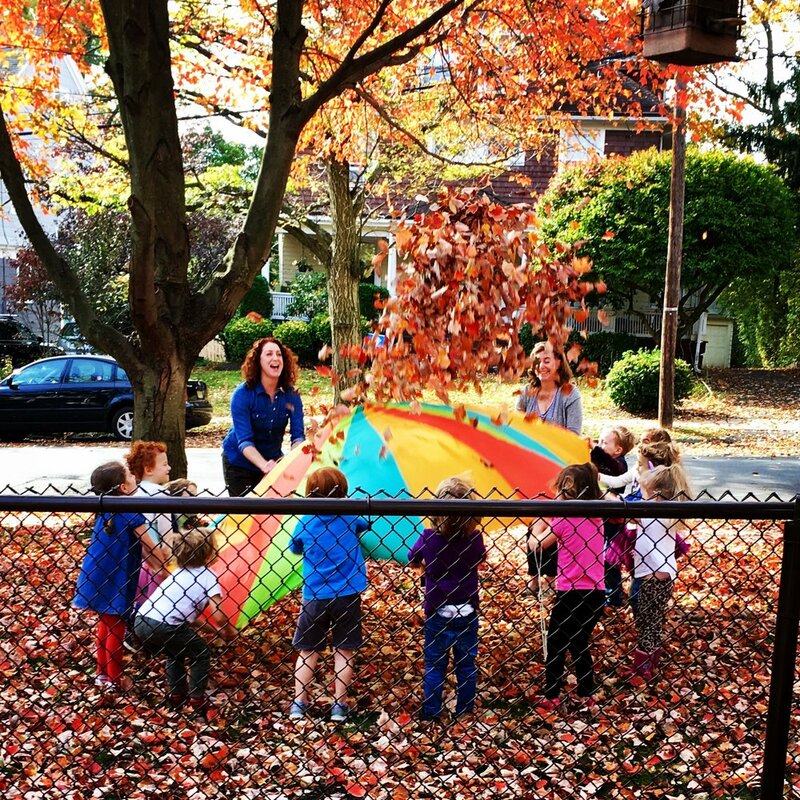 Each session includes a period of supervised physical recreation in the outdoor playground or, in inclement weather, in the inside play space. A 30-minute weekly art class preceded by lunch brought from home. This program focuses on “process art,” which engages children in experimentation and develops a sense of wonder and play. Children are encouraged to value their own ideas, discover their capabilities and the joy of creating. Students will be introduced to a variety of art materials and processes, as well as develop a visual language. Teaching artist Amiee Mower Lally is a current Morrow parent. She has been teaching art to children as well as adults for the past 15 years. She has taught and curated exhibitions for the Guggenheim Museum and the Queens Museum of Art. Carolyn Brush has been practicing yoga for 13 years. Her passion for children inspired her to get her children’s yoga certification. Carolyn believes that yoga at an early age encourages self-esteem and body awareness. Yoga brings that marvelous inner light that all children have to the surface. She uses poses, music, story, and games to create magical adventures where the children learn to become Omazing Little Yogis. Carolyn is currently teaching yoga in our 3-year-old classes. Does your child love moving and grooving to their favorite songs at home? Then this is the class for you! This fun, play-based movement program will help your child grow their love of music and dancing while encouraging defined gross motor planning and coordination. Through song, games and prop play your child will learn the basics of dance and movement always with a smile on their face. To learn more about Miss Shona, visit her website www.MissShona.com.